This young heifer which leaped into the bullring on the morning of the 8th of July would never have imagined that it would feature as one of the most awarded photos of 2015. And now Álvaro Barrientos has been awarded the gold medal at the XII China International Press Photo Contest (CHIPP) for this shot of the young heifer leaping out of the pen and into the arena. This award has been given by one of the most prestigious photo competitions in the world organized by photo-journalists from China for photographers from all over the world. The jury felt that this photo from Álvaro Barrientos possesses all the technical and artistic qualities to be given the gold medal within the category of Culture, Science and Technology. The snapshot was taken from the right side of the fencing within the Bullring, just beside the gate of the pens. In the image we can see another photographer, Joseba Etxaburu, who is crouched down beside some of the runners in the arena. 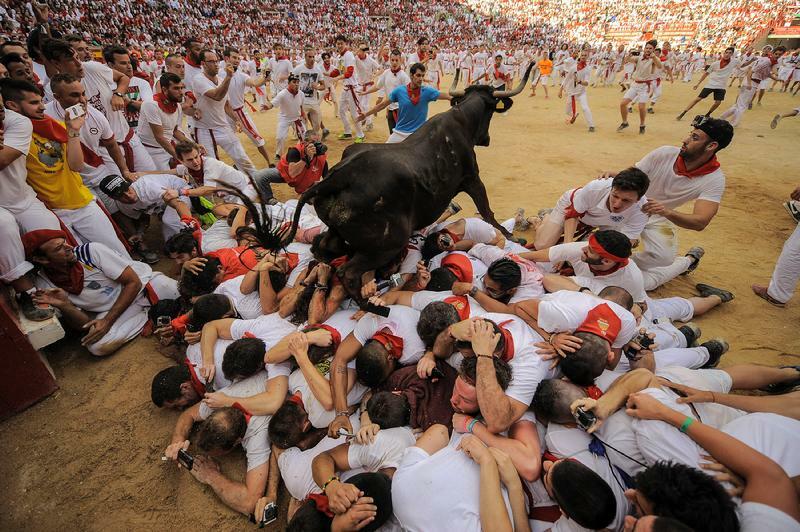 This photographer who is taking the photo at that very same moment was also awarded for his snapshot by the Reuters Agency, who considered it as one of the photos of the year, as was reported by Sanfermin.com at the time. © REUTERS/Joseba Etxaburu. 8 julio 2015. This is the first time, as far as we know, that the very same incident from a Sanfermin event receives two important recognitions from two different awards. This photography competition is not unknown to us as one of our colleagues, Jordi Cohen, was awarded second prize in 2010, within the category of Sports. China is a country which is now demanding a lot of information about the Sanfermin fiestas, and this is also shown by the recognition given to Pedro Armestre for his famous image of Estafeta Street from the HPA in 2015. Another expert photographer of the Sanfermines, Daniel Ochoa de Olza, was given the gold medal in the category of collections (series) about his work in the Greek crisis of last year. Furthermore, our tourist service for renting hotels and balconies in Sanfermin run by Mikel Ollo, informs us that Chinese travelers has doubled their bookings over the past five years and they are expressing a high interest and curiosity to learn more about our traditions and culture.